You don’t hear anything new when I tell you that Magnus Carlsen is a fantastic endgame player. He has a habit of winning his games from drawn or slightly better positions. 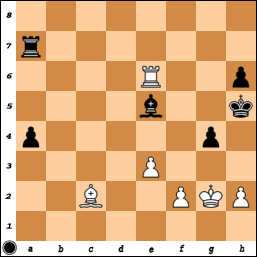 The diagram position is from his game with white against Shirov. Shirov is well known for his fantastic attacking style. But in this position it’s is clear he has to defend. Maybe that was not his cup of tea? Shirov played 1. – Bg7? This is a mistake. He could have held the draw with 1. – Bb8 according to Krasenkow in Chessbase Magazine 125.